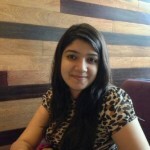 The primary concern for you a parent – is the health of your baby. While buying baby care products, it is very important to keep in mind the sensitive skin of your baby. 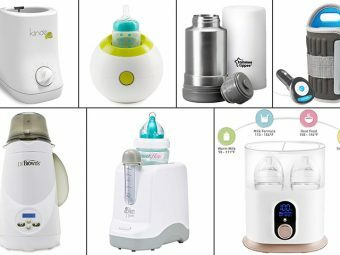 Choose only products which are specially formulated for babies. The chances of your baby getting skin irritation and/or infections are reduced as the ingredients used in these products are gentle as compared to regular products for adults. While choosing the baby care products you need to check the ingredients label to ensure quality whether or not they may cause irritation to your child. We bring to you some top baby products from the leading brand Aveeno. This brand is quite popular with new parents and is ideal for the different needs of your baby everyday. The shampoos containing artificial fragrance are harmful for your baby’s health. 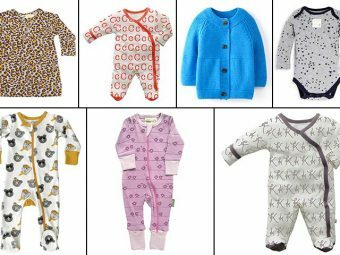 Such products can cause irritation to your baby as the skin is soft and sensitive. You should choose a kind of a shampoo that is specially formulated for less irritation and that causes less or no burning sensation to the eyes of your tender baby and is tearless at the same time. 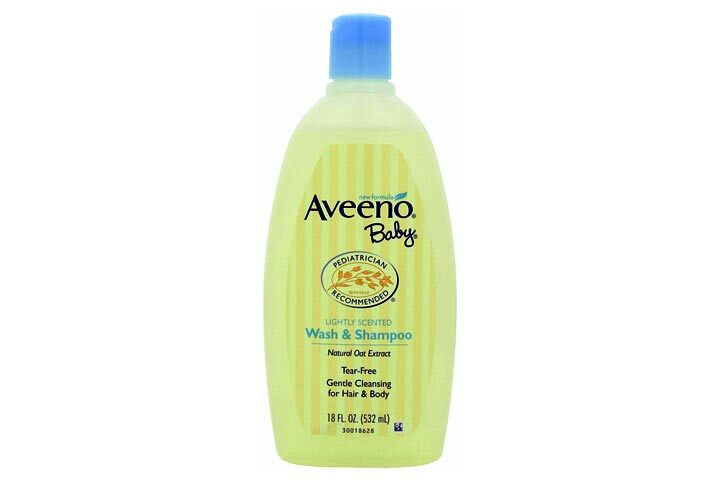 Aveeno baby shampoo is a mixture of natural oat extract into a rich whip wash that cleans without drying because it is soap free and allergically tested. This shampoo is formulated with the tear free formula and can be used on the hair and skin for the mild wash to wash your baby making him clean and leaving a gentle fragrance. You may feel that your baby’s hair becomes dry in winter. This causes your baby irritation by forming dry scalp on the head. 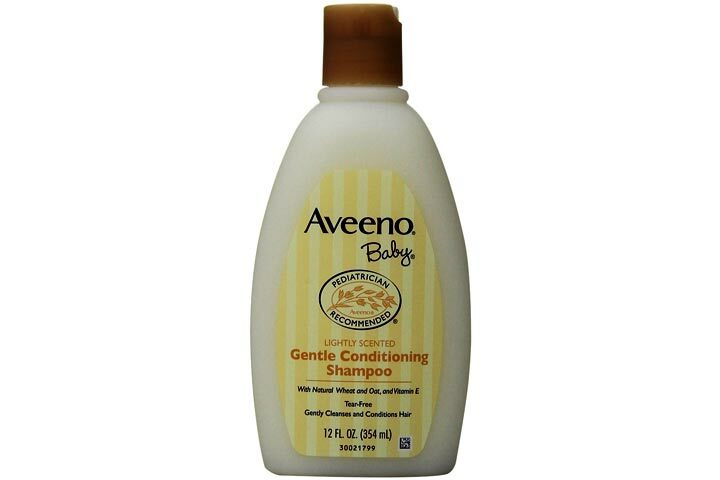 Aveeno baby gentle conditioning shampoo is a mix of natural wheat, oat and vitamin E to mild wash and condition baby’s hair. This is specially formulated for your baby’s sensitive hair, this unusual conditioning formula keeps your baby’s hair soft, smooth and easy to manage with a fresh, light fragrance. It is tear free, paraben free, soap free and allergy tested. The baby moisturizers had mineral oil as their main ingredient few years ago. Later this formulation proved to be harmful for the sensitive skin of the babies. Now most companies use natural oils like chamomile and sunflower for manufacturing. This Aveeno baby daily moisture lotion contains natural colloidal oatmeal mix with rich oils that gently helps to protect your baby’s sensitive skin. The naturally beneficial, non-oily formula absorbs quickly and stay moisturized for 24 hours. 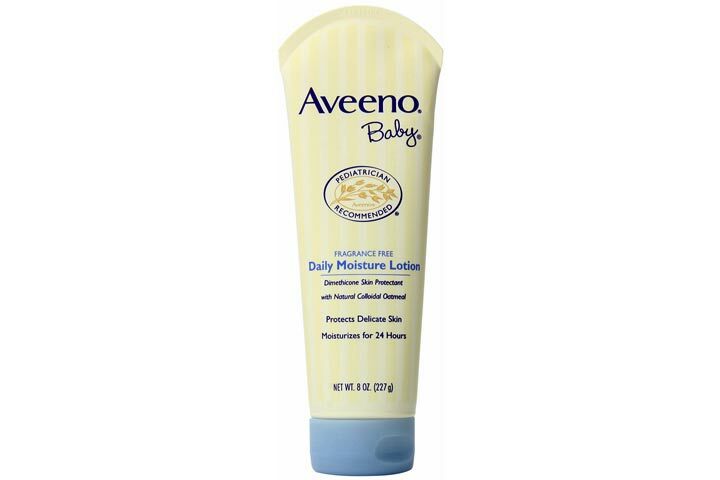 Aveeno baby lotion is formulated to be hypoallergenic, fragrance free and mild enough for daily use. Dryness on the skin of on babies like eczema or any allergic on their face and neck are common. You should opt for a cream that helps moisturize your baby’s skin healthily and provides relief from irritation. 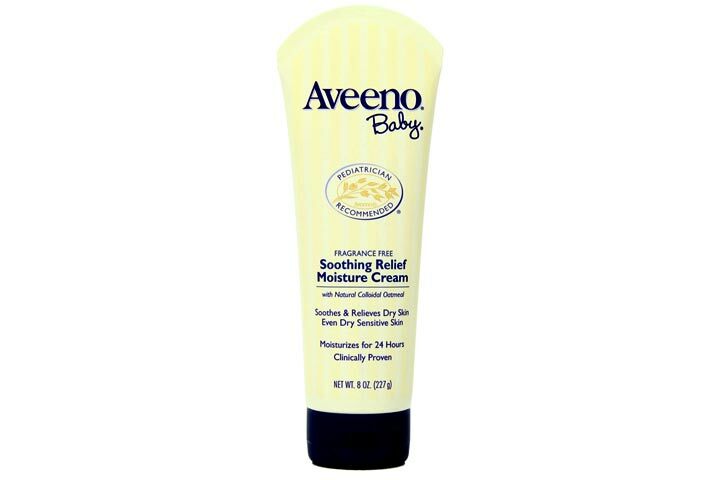 Aveeno baby soothing relief moisture cream has been clinically proven to moisturize for 24 hours and soothe your baby’s dry and sensitive skin. The ingredients used in the cream are active naturals and colloidal oatmeal that easily soothe the dry and sensitive areas of your baby’s skin. If you are looking for a sun stick cream to carry when traveling with your baby, then the Aveeno Baby Natural Protection Face Stick is a good pick. It is made with naturally-derived ingredients and is gentle for even the most delicate of baby skin. The sunscreen also has oats extracts, which soothes the skin. The cream offers broad-spectrum protection from UVA and UVB rays with a sun protection factor (SPF) of 50. Water resistance is for 80 minutes without the use of oil in the ingredients. There are no added fragrance, parabens, phthalate, and dyes. For young babies eczema is common. It is usually seen on the cheeks, scalp and forehead. Effects mostly appears in diaper area and is often worse on the crawling surfaces, knees and elbows. Eczema is the condition where skin gets very dry when it comes in contact with an allergen or if the skin is infected. In babies, saliva spit may cause additional irritation on chin, cheeks and neck. 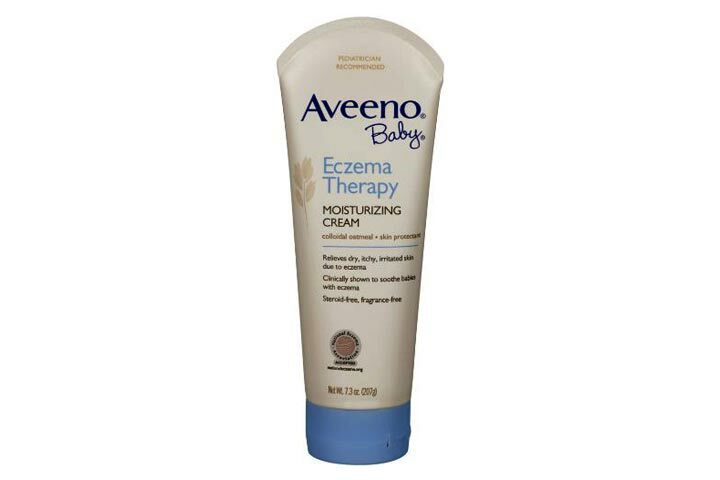 Aveeno baby eczema therapy moisturizing cream is clinically proven and helps reduce itching and irritation caused by eczema. It is specially formulated with active natural colloidal oatmeal, and it softens the irritated skin and intensely moisturizes to help strengthen the skin’s natural obstruction features. If your baby is more prone to eczema, the affected areas need to be cleaned with lukewarm water. If you are using any product for treatment, see that it is perfume free. Most bath products with perfume can irritate the skin and cause more problems for eczema. 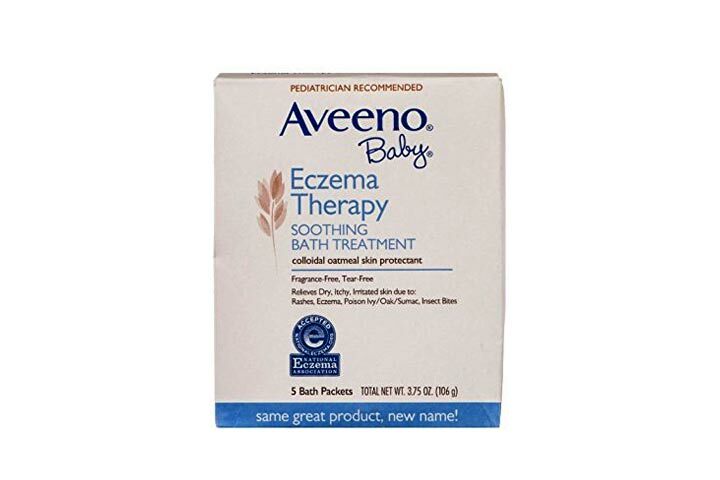 Aveeno baby eczema therapy is a soothing bath treatment that relieves dry, itchy skin, rashes and other minor skin irritations. It is specially formulated with an active naturals colloidal oatmeal formula. This powder forms a milky bath that soothes and easily washes without soap. It is a fragrance free, tear free liquid ideal for eczema. It is important to keep your baby away from harmful sun rays especially till the first 6 months. 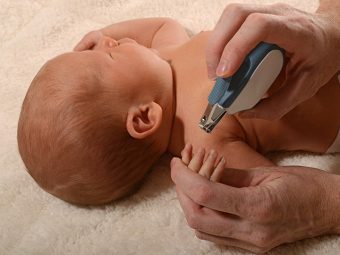 Baby’s skin is tender compared to adults. Always select a chemical free sunscreen for your baby, but with important elements like zinc oxide or titanium dioxide. Keep your baby away from sunrays as much as possible. 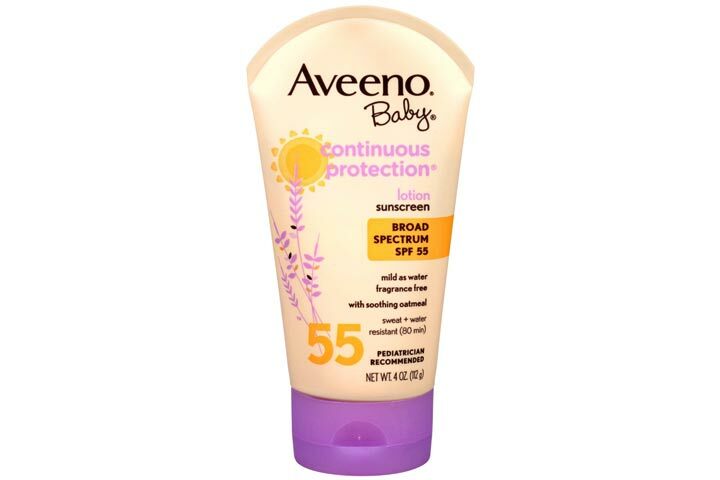 Aveeno sunscreen lotion is designed to protect your baby’s sensitive skin from the harmful ultraviolet rays. This is a natural protection lotion, containing sunscreen with broad spectrum SPF 50 equipped with MINERALGUARD technology and naturally sourced ingredients. This sunscreen lotion is specially formulated with active naturals, oat extracts and mineral ingredients such as zinc oxide and titanium dioxide. 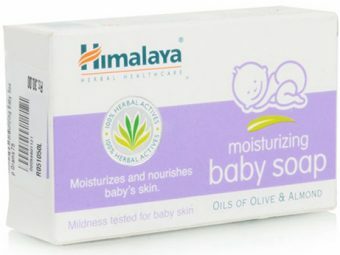 It ensures your baby’s sensitive skin is protected in the most gentle way. A gentle massage provides great comfort to your cherub during or after a bath and before bed. You often massage your baby by pouring a small amount of oil or lotion in your hand. The idea is to calm and relax the baby’s body. 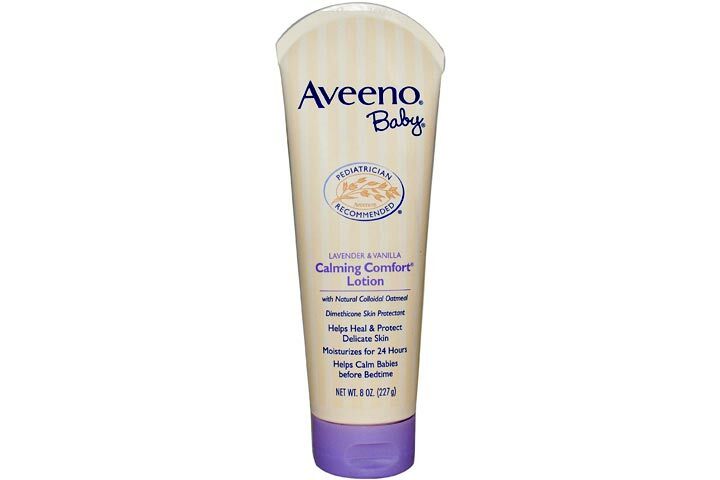 Aveeno baby calming comfort lotion contains scents of clam lavender and relaxing vanilla. The research studies show that a massage relaxes babies to improve overall well-being. Aveeno calming comfort lotion helps your baby calm and comfort your baby before bedtime and nap time. This lotion is combined with natural moisture- rich colloidal oatmeal – a non-greasy formula that helps protect baby’s dry and sensitive skin. The lotion feels gentle, smooth and healthy. Bath before bedtime for a baby helps to drift into a good sleep. Before using the baby bath products you need to look out for the ingredients to check whether they are suitable for your baby’s sensitive skin or not. If your baby suffered from eczema before or with any allergy like asthma, you need to consult a doctor before using such products. 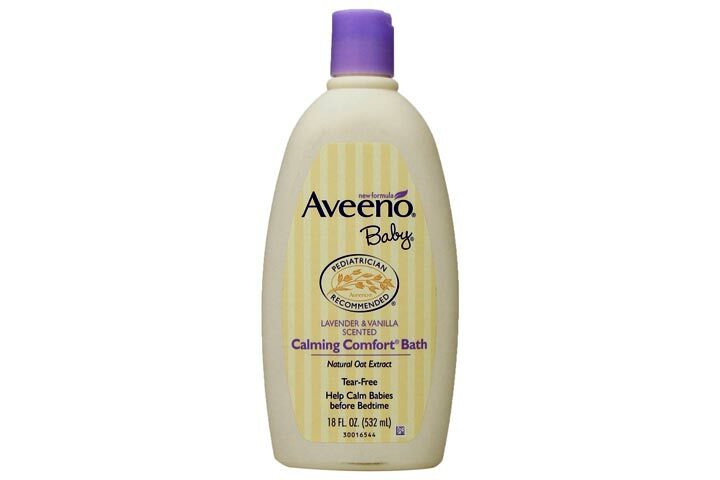 Aveeno baby calming comfort bath contains the fragrance of lavender and vanilla. It is clinically proven to calm and comfort the baby before bedtime. It has a soapy tear free formula that washes without drying and is mild enough for baby’s delicate skin. Please be mindful about the following pointers while using baby care products. 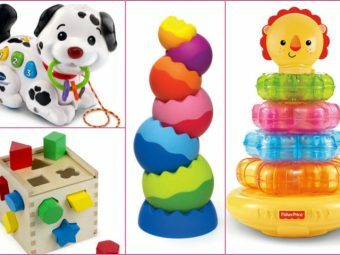 Shop carefully for baby care products. Always check for the ingredients before buying them. Always avoid products that contain harmful chemicals. When you use soaps and shampoos for your baby you should use the ones that are gentle and moisturizing. You need to apply powder, oil and cream only for making your baby’s skin healthier. Baby products must not cause any allergy or irritation to your baby. If you observe any rashes developing on your baby’s body or any discomfort experienced on the skin post using the product, immediately discontinue using the same. It will also be better to consult a doctor in case of such incidents.